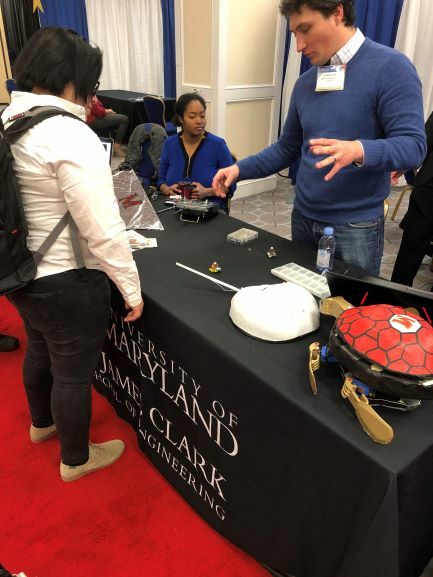 The Maryland Robotics Center (MRC) demonstrated bioinspired robots at the 2019 Annual Meeting of the American Association for the Advancement of Science (AAAS), held February 14–17 at the Marriott Wardman Park and Omni Shoreham hotels in Washington, D.C. The bioinspired robots were shown as part of the meeting’s expo events. Representing Maryland at the meeting was Dinesh Manocha, Paul Chrisman Iribe Professor of Computer Science and Professor of Electrical and Computer Engineering at the University of Maryland. Manocha is an AAAS Fellow and an MRC faculty member. Lena Johnson, a PhD student in Mechanical Engineering, along with Ivan Penskiy, MRC Robotics Realization Lab manager, showed Robo Raven, Robo Crab and Tiny Terps to AAAS meeting participants and visitors. RoboRaven is a mid-sized bioinspired flying vehicle that mimics bird wing flapping for its flight. RoboCrab is a bioinspired self-righting robot designed to mimic the actions of a horseshoe crab as it crawls over rocks and sand. Tiny Terps are low-cost, modular, microrobot platforms that work collaboratively. They are used to study robot sensing and control across a large number of miniature robots. “This event was truly multidisciplinary, encompassing different domains of science,” said Johnson. “This enabled us to interact with people working on different streams of science and correlate the ideas to applications in robotics,” she added. AAAS interviewed Manocha and Johnson on camera during this event. Manocha spoke about his research and Johnson explained the robotics platforms and their applications. AAAS is a non-profit organization dedicated to advancing science around the world. Each year AAAS brings together leading scientists, educators, policymakers, and journalists to discuss the latest developments in science, technology, and policy. This year’s theme was “Science Transcending Boundaries."